I was pretty sad to hear about John Hughes passing last week. His movies (no matter that they sometimes veered into schmaltzy territory) were such a key part of my youth... While he wasn't necessarily a cinematic genius, he definitely captured the zeitgeist of the 80's. The music, the teenage angst and romance, the clothes. It was all there; and it was perfect. My all time fave Hughes movie is without a doubt Sixteen Candles (with Ferris Bueller's Day Off a close second.) My mom rented it for me one weekend, and I watched it, wait for it, 13 times in 48 hours. I was obsessed. I can still quote huge chunks of that movie -- sad, I know. When the girlies get older, I'm definitely planning a John Hughes marathon... We'll kick off things with Ferris on Friday night, do a back-to-back Sixteen Candles and Pretty in Pink on Saturday and finish out the weekend with The Breakfast Club. So what's your fave John Hughes movie? I still have a crush on Jake Ryan!! "Sixteen Candles" without a doubt is my favorite. I can't even count how many times I've seen it, and yet I still have to sit down and watch it if it comes on TV. Pretty In Pink is my all-time favorite. I so, so, so love that movie. I know it was so sad! And Sixteen Candles is my definite fave. But I have a lot of love for some of the less popular ones as well; Some Kind of Wonderful, She's Having a Baby and Weird Science. OMG! I just watched Sixteen Candles this past weekend and confessed to my boyfriend that I STILL have a huge crush on Jake Ryan. Know idea how many times I have watched that movie and wished I was Samantha. Definitely one of my all time fave movies. My husband and I like to describe what our boy Dash is wearing and then say, "What, no he's not retarded." Cracks us up every time, even though it is meanspirited and you'd never hear that line in a movie today. RIP Hughes! For me it was pretty in pink. I was about 2 years younger than Andie (Molly ringwald's character), and it had a huge impression on me! so my high school experience was all about dressing in vintage, working in record shops, and dreaming about the day i could buy my very own karmann ghia. i still LOVE the psychadelic furs, and can quote almost the entire movie line by line. sixteen candles all the way. i used to rewind and rewatch the end sequence of Jake picking up Samantha at the church again and again. molly ringwald has a piece in today's nytimes op/ed about john hughes, and working for him, and remembering him. You are NOT alone in your love of Sixteen Candles! 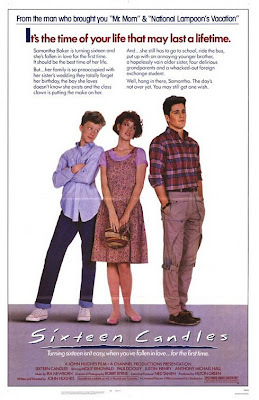 It is my favorite John Hughes film and one of my favorite films EVER. I was all of three when it first came out, but I remember watching it on tv every year around Valentine's Day starting when I was 7 or 8. It was then that I pledged my love and devotion to Anthony Michael Hall or Farmer Ted, whatever you want to call him. I thought he was so charming and witty and funny and he obviously liked Sam. I was completely smitten and couldn't see the appeal in the broody, sullen Jake Ryan. Although I NOW see his appeal of course (the man looks like a Greek god), I still prefer Ted's dorky antics. He makes me laugh and that's what really matters in this world! And I have committed nearly the entire movie to memory. Till this day, I still exchange quotes from the film with my siblings. "Fred, she's gotten her boobies!" Love the 80's film weekend idea, such a great time watching those! Oh my gosh! I love this movie. I'm so glad you posted this ... now I'm going to see if I can rent a copy of it tonight! Hands down, Sixteen Candles! I remember that my mom rented it for me to watch again on my 16th birthday and thought it was such a cool thing of her to do. Turning 16 while drooling over Jake Ryan...perfect! kelly -- the music in that church sequence...swoon. Sixteen Candles, hands down best ever. Pretty in Pink and She's Having a Baby are my Favs . The soundtracks do wonders for an 80's girl! Oh man. I so swooned over him as a girl. Oh! No doubt! I seriously can't wait for that day either! Perfect movie weekend plan... I'll have to remember this! I'm still crushing on Jake Ryan and still looking for MY jake ryan. Love all the John Hughes movies...it was So a part of my high school years. I think 16 candles is my favorite though. Loved Molly Ringwald too. One of my former managers was named Jake Ryan...how funny huh?? Jake Ryan will ALWAYS be my ideal. 16 Candles was playing at my house pretty much non-stop through my teens. My sisters and I throw out quotes at any available opportunity. And I can't see a red porche without sighing and thinking of the perfection that is Jake Ryan. Oh Sixteen Candles, no contest! Jake Ryan dancing with his perfect girlfriend to Spandau Ballet while Molly looked on was the definition of high school angst - and all the hookups that ensued from that night were the definiton of high school hopefulness! sigh, Jake Ryan. 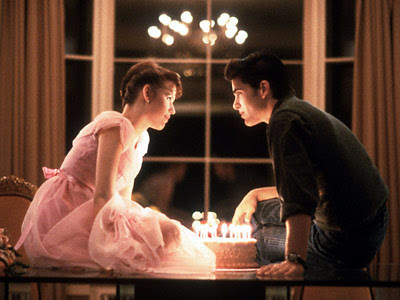 My favorite John Hughes movies are Sixteen Candles and Pretty in Pink. Seriously. Jake Ryan is still a cutie. That actor disappeared, but he was dreamy in "Mermaids" too. I love "She's Having a Baby." It always tears me up! Oh, I could watch those movies over and over...actually when we all got together(all 10 families) at the cottage last week, we watched Ferris...it's amazing how many lines we were all able to recite...after having not seen the movie in over 10 years! Have a good day...just found your Food Blog...love it! I'd have to say Pretty in Pink. I used to dream of naming a daughter Andie. I thought Molly Ringwald's Andie was the best: she could sew, she was different from everyone else, and she drove the coolest car! Awww...my all time favorite movie is The Breakfast Club. My best friend and I watched it over and over and over. I may just have to netflix that baby and snuggle up with it one more time in Mr. Hughes' honor. All of them are so good, I simply can't choose!